You are here: Home 2015 October The New Cisco IW 3700 Series AP, What Does It Support? We talked about the new Cisco IoT System before. It was announced in June this year. And Cisco also launched new Internet of Things products within the six pillars. The new Cisco IoT System consists of 15 IoT products ranging from 4G modules to security cameras to mass-transit WiFi access points, all aimed at “turning data into action”. 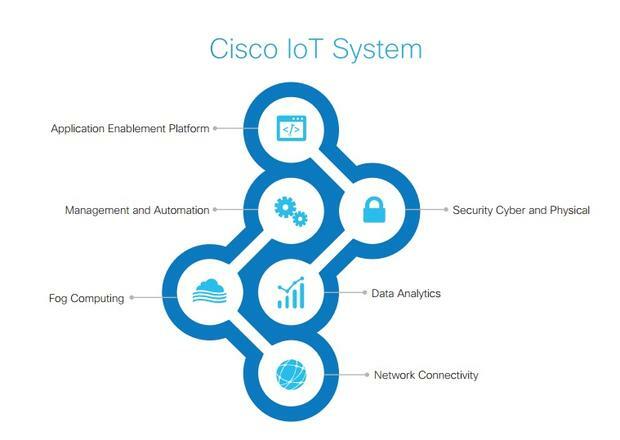 Cisco IoT System is based around six “pillars” to create a complete architecture. The first is network connectivity, available in ruggedised and non-ruggedised form factors. Second is fog computing, a system designed to bring IoT analytics to the edge of networks, analysing data locally before adding it to the cloud. Third is security, ranging from IP surveillance in the real world to malware prevention in cyber space. Data analytics is fourth, linking the system into the Cisco Connected Analytics Portfolio, while offering options for third-party integration too. Management and automation and application enablement APIs complete the sextet. In this article, we will introduce a new Cisco wireless access point-the Cisco Industrial Wireless 3700 Series Access Point (IW3700 Series). It extends Wireless Network Connectivity for IoT. The IW3700 carries forward the industry-leading features of the Cisco Aironet 3700 Series. 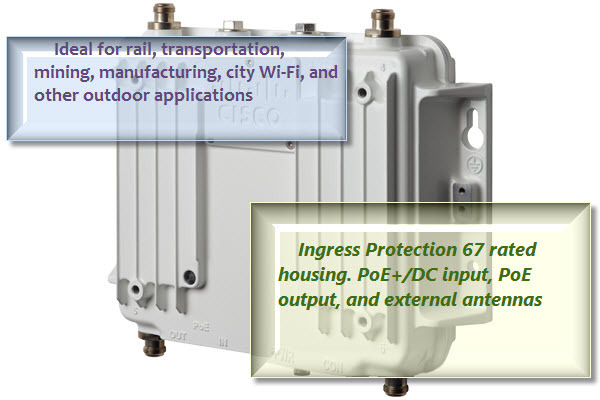 The new Cisco IW3700 Series is the first industrial Wi-Fi outdoor offering to include 4×4 MIMO with three spatial streams and beamforming. It offers industrial-grade environmental qualifications while providing higher speeds for video and other bandwidth-intensive applications. Use it to extend support to Wi-Fi clients, such as smartphones, tablets, and high-performance laptops that have integrated 802.11ac support. Delivers industry-leading 802.11ac Wi-Fi to the extreme edge to improve user experiences and safety for mass transit systems, mining sites, and other IoT deployments. Designed and certified for extreme environments with extended operating temperature ranges of -50 to +75°C; vibration rated to IEC 60068-2-6 environmental standards with M12 I/O connectors; and rugged IP67-rated housing to protect against liquid and dust ingress. Supports Power over Ethernet (PoE) output to enable external devices such as ruggedized IP cameras for improved worker and passenger safety and better asset security. Employs a scalable and secure mesh architecture for highly resilient Wi-Fi services. Extends the Cisco Unified Wireless Network, which can scale to 18,000 access points with full Layer-3 mobility across central or remote locations. Automate and integrate mining, transportation, manufacturing, and other industrial processes through wireless technologies for enhanced monitoring, production control, asset or personnel tracking, and internet access. Gain visibility into equipment functionality, worker locations, and security system statuses to boost efficiencies and enable better decision making. Enhance user experiences for rail and other public transit passengers through high-speed wireless networks. Improve safety for rail passengers, employees, and entire systems with advanced cyber and physical security tools and analytics. Offer outdoor wireless access services in a variety of geographies with an extended temperature range and an unobtrusive form factor. If you wanna get more information about the new Cisco IW 3700 Series, you can read the Cisco IW 3700 Data Sheet, Cisco IW 3700 Series Ordering Guide to learn more.